Wind simulations and wind tunnel experiments can give architects and structural engineers crucial insights to their concept. That’s why it’s best do to them at the earliest stage of the design process. For the Chinese skyscraper, Shanghai Towers, for example, optimizing the design from a rectangular to a twisted shape reduced wind loads by 24% saving $58 million worth of building material. Ingrid Cloud automated process applies geometrical heuristics to create an initial mesh, which is then refined only where necessary. This is a unique Ingrid Cloud feature! Guided by a posteriori error estimation in wind load prediction, the adaptive algorithm constructs local error indicators that decide what cells in the mesh must be refined to optimize the mesh. 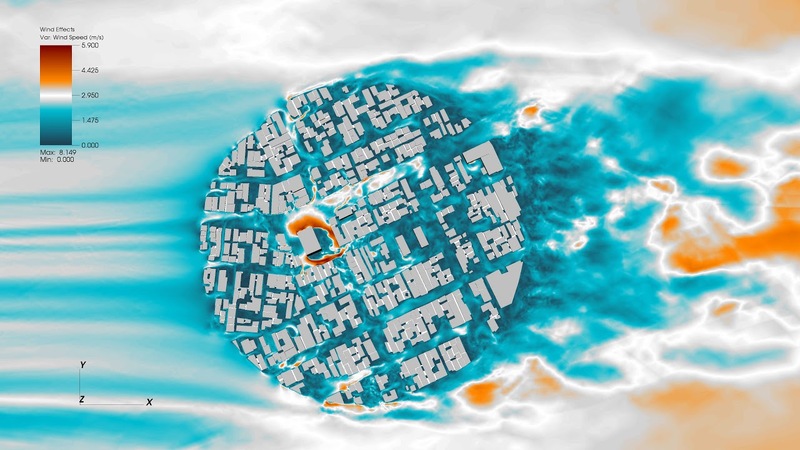 This is the final result of a wind simulation produced with Ingrid Cloud software. The model shows Niigata City, in Japan. The return from the real estate investment is based on the price the owner can charge for the rent. If shop or restaurant owners begin to lose customers and revenue due to low levels of pedestrian comfort, the demand for the commercial real estate will drop, so will the rent price, and the overall value of the property. There are examples of urban wind comfort failures in almost every big city. They often go unnoticed. When a business property is not performing well, hardly anyone checks if the pedestrian wind comfort may be the reason. The majority of new buildings being built today are between 35 to 100 meters tall. Those structures cause a significant impact on the urban microclimate. High rise buildings shape the outdoor comfort all over the world, making a significant impact on solar radiation and wind speeds. Continue reading: High-rise building or skyscraper: what’s the difference?